"Where are the pics of eggs?!" was the question sent by e-mail, and yes, other than the eggshell remnant shown at the bottom of this page, the lack of egg pics seems to have been an oversight for a very long time on this website. So it's getting fixed with this page. Most of the images below, except where noted, were shot with a Microsoft Lifecam HD-5000 webcam running in manual-focus mode. 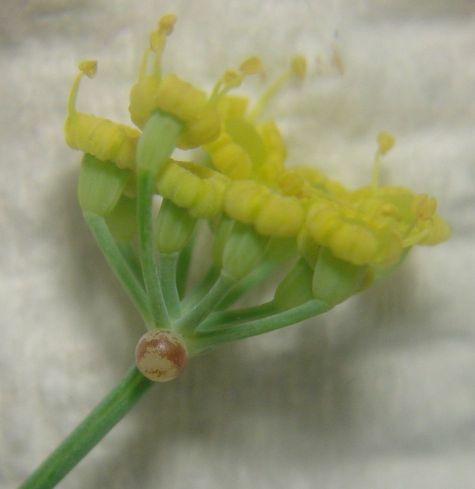 Eggs tend to be laid mainly on young and healthy growing fronds (fennel leaves), and to a lesser extent on developing flowers and their stems (although perhaps it only seems lesser due to the difficulty of seeing eggs on these more-complex structures). They tend not to be laid on fronds that are old and yellowed at the tips, or that are festooned with general garden crud, spider webs, or aphids. Female butterflies are, to their credit, generally fastidious and desire the best for their offspring: a clean, nourishing, and fresh frond or flower bud to nibble on after the remnant eggshell is consumed by the newborn caterpillar. However, it must be admitted that as summer wears on and as the fennel plants go to seed and the whole plant gets grungier and more aphid-infested and inhabited by various other insects, the butterfly moms still must lay their eggs somewhere, and so eggs and tiny caterpillars can occasionally be found amidst the grunge. Below are a few eggs attached where they were recently laid by mom. 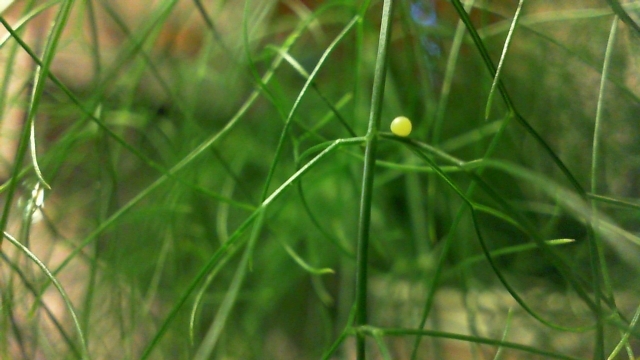 A dab of sticky glue (silk of some sort) is what keeps them attached to the fennel stalk. They adhere pretty firmly and do not fall off. 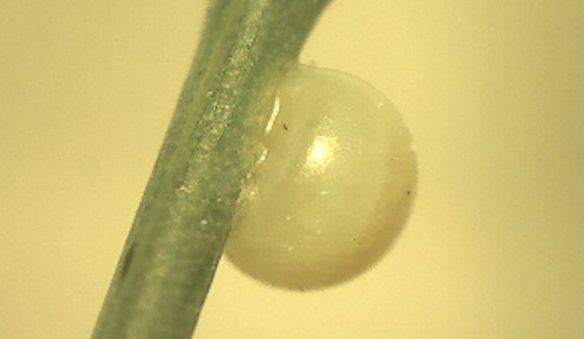 The eggs are about 1mm in diameter and appear to be perfectly spherical except for a somewhat flattened base where they are attached to the frond. The shell of the egg is composed of layers of proteins with a waxy outer layer that reduces water loss. There are tiny pores in the surface to allow air to enter, and a pore large enough to allow the sperm cell to enter to fertilize the egg. For the first couple of days the eggs are a pearlescent yellowish white and glisten in direct sunlight. They are not in sunlight here. 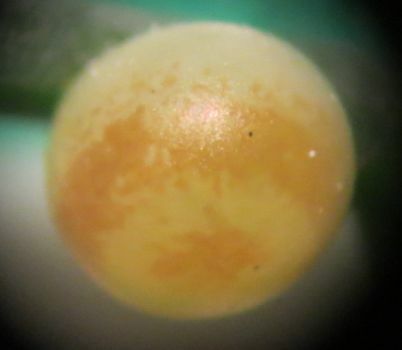 Then, as the caterpillar embryo develops, the egg will display an orange-brown band around the egg above the equator. The band can be faintly seen on the right side in the close-up two pics above. Then, for a couple of days before hatching, the color darkens and ultimately becomes a tiny curled-up black caterpillar sloshing in liquid if you can examine the egg at sufficient magnification. An EMPTY egg? It happens from time to time. At least they appear empty. Perhaps they have clear fluid inside. This image was shot through the eyepiece of a dissecting microscope. Uh-oh -- 1 day later and the brownish band (baby caterpillar-to-be) is clearly visible --- this is embryonic action and makes me suspect that the eggs were not laid as recently as I had thought. It looks like the caterpillars are well on their way. Whether this fairly sudden change reflects rapid development, an increase in transparency of the shell or contents, or the activation of genes for pigment production, I do not know. Note the "polar" structure. 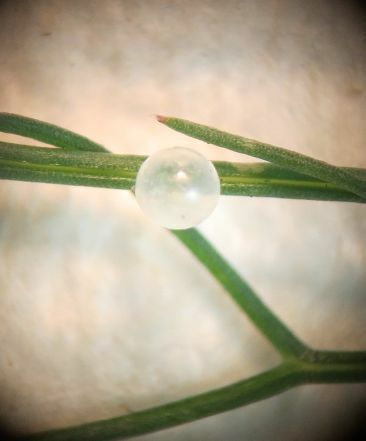 It is seen in all the swallowtail eggs I have looked at. The image below was shot with a Canon Powershot SX260 HS camera. The fennel branch is sitting on a paper towel. When looking thru the stereo dissecting scope, the above orange-brown structures appear to be very near the surface of the egg and mostly 2-dimensional. They do not yet appear to be a developing caterpillar floating within. But they are, and that fact becomes much more obvious within a day or so. The dark color results from the embryonic caterpillar filling up the egg. At this stage, the caterpillar can emerge soon. The ones above started chewing their way out of the eggs a few hours after the pictures were taken. The actual emergence of the caterpillar happens very quickly and unfortunately none of these was caught in the actual act. Below is a video shot through a dissecting microscope showing movement of an embronic caterpillar within the egg. Use the full screen to see the movement more clearly. Below is another video of the same egg still closer to the time of hatching. At this point, a bubble has formed within the egg at its upper right. Also note the cameo appearance of a very small insect meandering in from the left side about 17 seconds into the video. Use the full screen to see the movement more clearly. Don't toss out that drowned cat! What is that weird thing? !